Have you found yourself needing to programatically clear DotNetNuke (DNN) cache but were dismayed to discover newer DNN versions no longer rely on an easily-cleared cookie? As an admin you have DNN's built-in options for clearing cache or even "resetting the application domain". Your end users, however, lack these options and, really, why would you want users to have to do anything special? You want a solution that's hidden and automatic. Below is a link to a free DNN7 module that does one thing: flush the cache. Drop the module on a page, set the VIEW permissions for whatever group(s) you want the module to be active for and that's it. Oh -- you'll also want to blank out the module's title field. And THAT'S it. user-specific data is cached when not logged in. The module itself has no configuration options. The only real point to consider is who you want the module to fire for. Users who are not logged in have no user-specific data to flush so you can rule out "Unverified Users" and, by extension, "All Users" (which is the combination of "Registered Users" and "Unverified Users"). 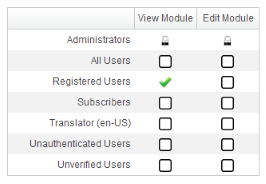 In most cases you'll probably want to set the VIEW permission to "Registered Users". Note that you do *not* want to use this module on pages with lots of traffic. Constantly flushing cache is an excellent way to cripple a busy site. This module is best used on infrequently-visited pages (such as a custom "user update" page). The module required less than 10 minutes to create using DNN's built in "module creator" feature (that means I created it from within a DNN website using nothing but the web browser) and less than 5 minutes to create the deployment package using DNN's built in "create package" feature but... those are topics for another day.